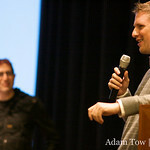 The third annual WordCamp San Francisco was held this weekend, bringing together WordPress users and developers to discuss the past, present and future of their favorite Web publishing platform. Since its humble beginnings as a fork of the b2\cafelog blog software in 2003, WordPress has grown to become one of the most popular blog publishing platforms. 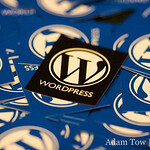 WordPress.com, the hosted version of WordPress, saw the creation of 2.3 million new blogs this year, with 35 million posts. 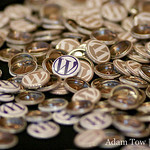 My history with WordPress goes back to when it first came on the scene in 2003. I was looking at third-party software to manage my personal Web site, which had outgrown the simple content management system I had written. I initially resisted using WordPress until version 1.5 was released in 2005. What pushed me over the top was the inclusion of static pages in the Strayhorn release. 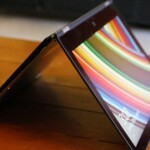 This allowed WordPress to be used as a full-blown CMS instead of just a simple blog platform. Over the next last years, WordPress’s CMS capabilities and versatility have grown to the point where it’s a great choice to power a simple blog, a community of blogs or even a corporate Web site. Walt Mossberg and Kara Swisher agree–after all, they chose WordPress to power All Things Digital. Automattic, the folks behind WordPress, are hard at work this year improving the WordPress experience. As millions more people choose WordPress to power their Web sites, the importance of having automatic updates is becoming very evident. 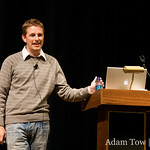 During his State of the Word Address, Matt Mullenweg, the lead developer and public face of WordPress, hinted at a future update mechanism (similar to Mac OS X Software Update or Mozilla FireFox) with which updates to WordPress Core, Plugins, and Themes can be applied in real-time without the user having to upload files or type arcane commands into a Terminal session. 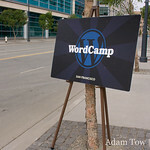 Having been to the previous two WordCamps, I can say that Automattic and the volunteers did a fantastic job organizing the 2008 edition. 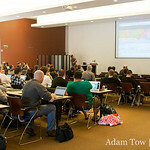 The new space at the Mission Bay Conference Center was a great upgrade over the previous location. 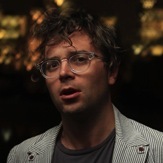 Still, a part of me misses seeing Matt sit in one of those thrones at the Swedish American Hall! 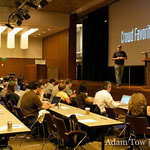 For more information and thoughts on WordCamp 2008 SF, check out the great coverage on Andrew Mager’s blog The Web Life on ZDNet. 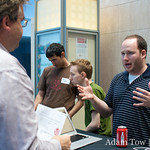 Finally, to find out more about upcoming WordCamps in your area, visit WordCamp Central. WordCamp 2008 was held at the Mission Bay Conference Center in San Francisco. 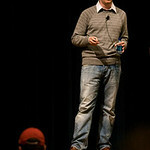 Stephen O'Grady of RedMonk presents at WordCamp 2008. 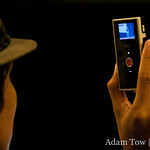 Filming a WordCamp session with a Flip Mino videocamera. Developer tech sessions at WordCamp 2008 in San Francisco. 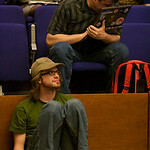 Barry Abrahamson, System Wrangler extraordinaire at Automattic. 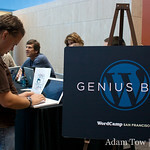 Apple has a Genius Bar, why not WordPress? 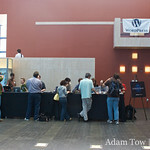 The Genius Bar at WordCamp 2008. 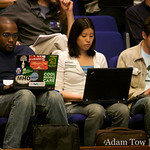 WordPress bloggers and developers at third annual WordCamp in San Francisco. 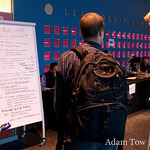 Job listing board for WordPress developers at WordCamp 2008 in San Francisco. 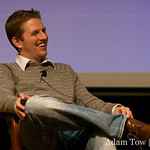 The State of the Word address by Matt Mullenweg at WordCamp 2008 in San Francisco. 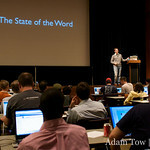 Matt gives the State of the Word address at WordCamp 2008 in San Francisco. 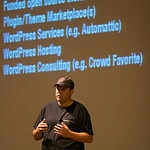 Matt talks about the past, present and future of WordPress during his State of the Word address at WordCamp 2008. 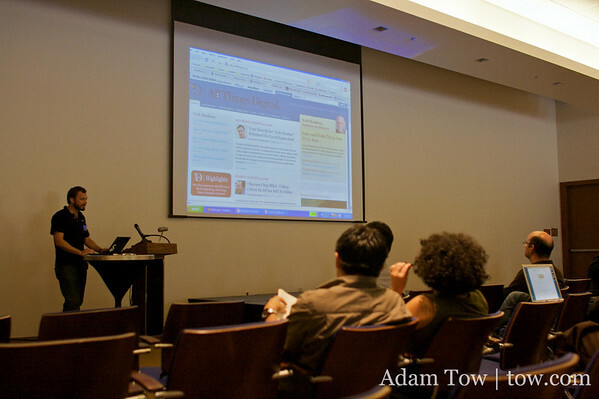 Toni Schneider, CEO of Automattic, shows a screenshot of AllThingsD during his presentation at WordCamp 2008 in San Francisco. 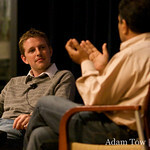 Matt interviews GigaOm founder, Om Malik on the future of blogging at WordCamp 2008 in San Francisco. 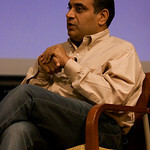 Om Malik announced GigaOm Daily and Gigalogue at WordCamp 2008 San Francisco. 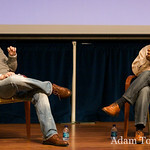 Matt laughs during his interview with Om Malik at WordCamp 2008 in San Francisco. 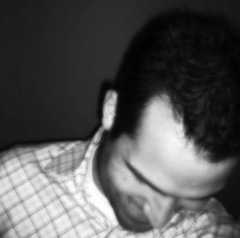 Om Malik explains how he's giving back to the WordPress community by releasing the plugins he uses on his Web sites. 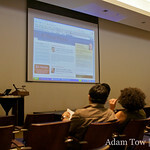 A panorama taken at the third annual WordCamp San Francisco conference held at the Mission Bay Conference Center.